You guessed it, I have been at it again. I really do like making soap but this time of the year, I do have a purpose. It is nearly Christmas and everyone I know will be getting soap – sorry to spoil the surprise, folks 🙂 Also, I have been selling a small amount. A Bridgetown friend has sold a few bars for me and I have sold some to friends and rellies. It is a seasonal thing. Soap makes great small Christmas gifts. I am even thinking of setting up a stall at the local markets during holiday weekends like Easter and, maybe, I will get organised and have a stall leading up to next Christmas. 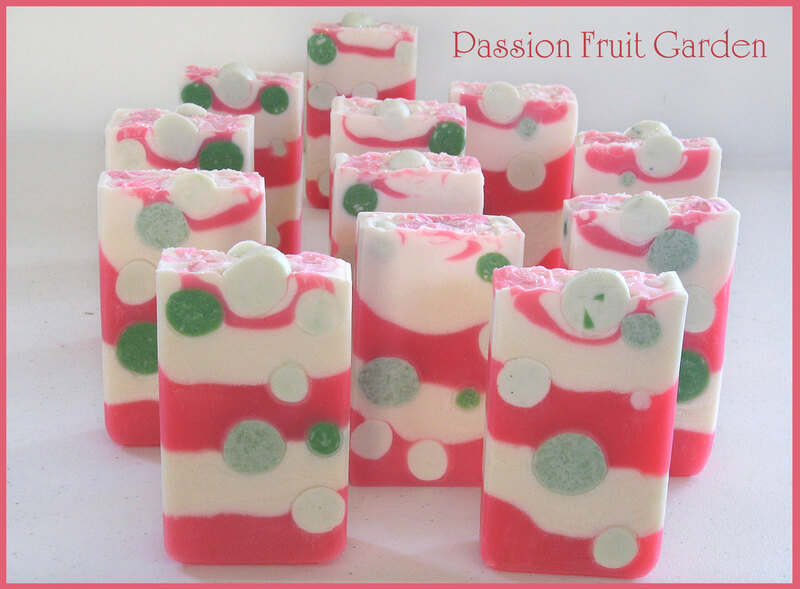 I have even come up with a name – Soaping Passion – what do you think? 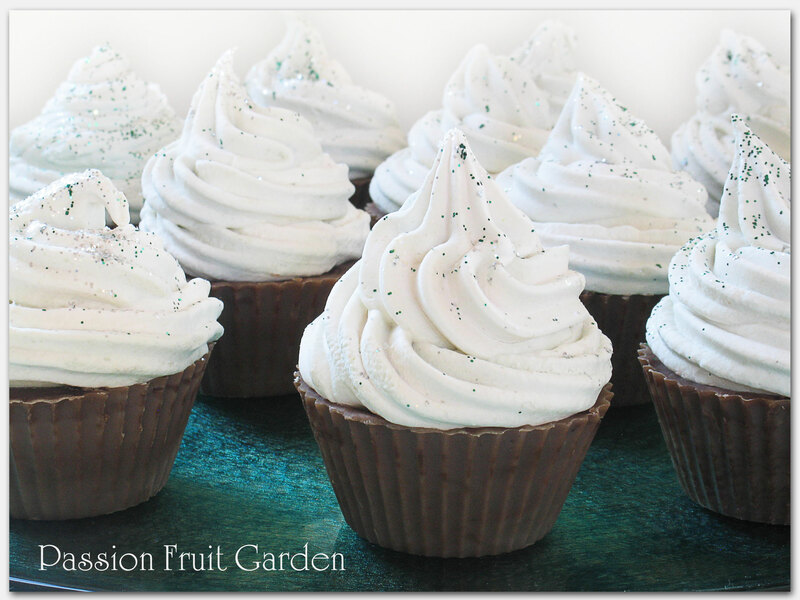 Cupcake soaps are so popular, I just had to have a go at making some. 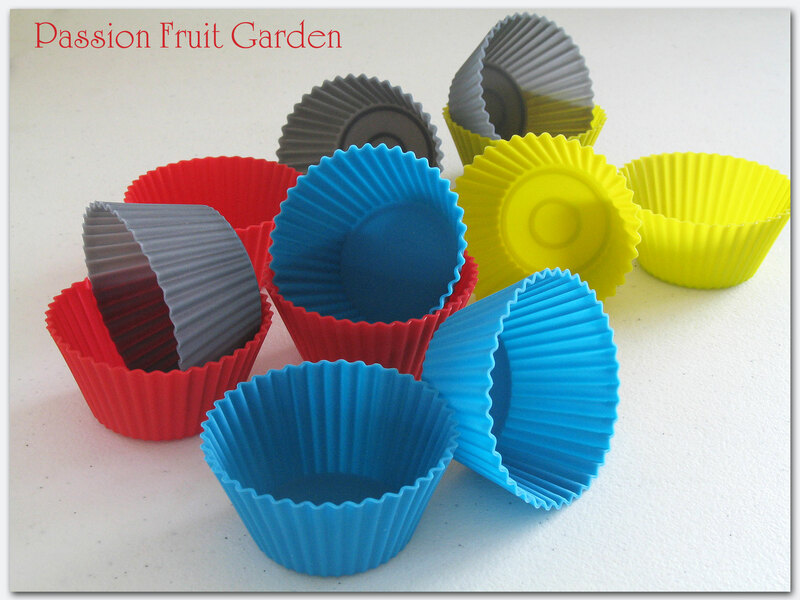 I knew I would eventually so, ages ago when I saw some silicon cupcake moulds, I bought them. 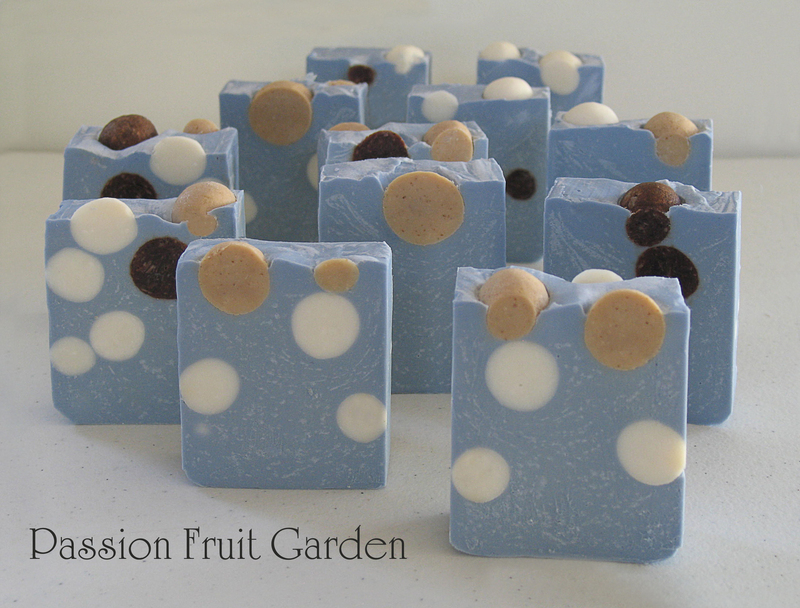 The soaps turned out rather well, even if I say so myself. Ok … of course, there were a few problems but I blundered my way through them. The base was coloured with brown oxide and the fragrance was Brambleberry Chocolate Italian Spice (which, by the way, smells divine). The fragrance will discolour the soap brown but I wanted to ensure it was a nice chocolate brown so I added the oxide. You would think the base would be easy, being plain, but I am fast learning that nothing is easy when it comes to soap making. The bloody fragrance made the batter rice so it was a bit of a drama getting it into the moulds. The icing was coloured with titanian dioxide and chrome green oxide and sea clay. I was going for a green swirl but the batter was too thin when I mixed the green with the white and, in the flurry of getting the batter into the icing bag, the green and white virtually merged. Normally, I have problems with the batter going too thick too quickly but, just because I needed it to be thick to pipe, this one did not move. The fragrance was Brambleberry Spearmint Eucalyptus. Because it did not accelerate trace, it would be a keeper but for the fact that after a day or two, you can barely smell it. Given my total inability to pipe a decent meringue, I was very excited that these turned out as well as they did. They look real. I have called these guys Christmas Cheer. I wasn’t trying to make something Christmassy, I was just wanting a colour to go with the green balls and hit on pink. When I cut them, it was Maus who commented that they look Christmassy. I think she is right. I do like the ball look. The white is coloured with titanium dioxide and the pink is neon pigment – fired up fuschia and the fragrance is Brambleberry Cherry Blossom. The fragrance did not cause any problems but is very light so I won’t be buying it again. I think this should be the end of soaping for a while unless I get off my bum and do start that stall at the local markets, otherwise, soap will take over the whole house. This entry was posted in Soap making and tagged Brambleberry Cherry blossom, Brambleberry Chocolate Italian spice, Brambleberry spearmint eucalyptus by Glenda. Bookmark the permalink. You got one as a gift though. Love the red, white and green christmassy looking ones. These beautiful cupcake soaps made me think of my darling dad who thought it was hysterical at ‘bring a plate’ functions to make a tray of beautiful lamingtons but in amongst them, stick a few he had made from sponge rubber. They looked perfect and stunning and he nearly cacked himself laughing as he watched people trying to eat them. Mum was never amused at his sense of humour! Don’t think soap cakes mixed on a plate of real ones would be too good though. You really are very creative! Cheers, thanks for bringing my dad back for a minute or two. You are very clever & talented Glenda. You are always coming up with amazing ideas. Great idea about setting up a Market Stall. The balls are very clever. There is something tactile and appealing about them. As to the cakes, I thought they were real when I first opened the mail! Thanks Karen. They do look very realistic. BTW pity you missed the cousins “get together” I hope all is well. I thought you were sharing a cupcake recipe!!! they look very realistic to me. Please sign up Angela wathen@ hotmail.com Thanks for great emails Neri..
Nerida, Please ask Angela to click on “follow”. I don’t think I can sign a person up. My sister Mary has opened a shop in Manjimup called Manjimup-cycling – she might stock your soaps if you want- if you want to see what she is doing or contact her she has a page on Facebook. Hope you well- we going to see you before Christmas?? Congratulations Em. Sure hope to catch up. Unbelievable Glenda- the first photo looked like some chocolaty cup cake that you were going to share with us for Christmas and then it yurns out to be a soap! Very creative. Thanks Francesca, I my sisters’ grand children will be getting most of them. I am sure little girls will just love them. You really are very clever, Glenda! You are too kind Liz. They look fabulous Glenda. The ones in the middle look particularly Christmassy and the bottom ones like something you’d find in an upmarket B&B by the seaside. Thanks Anne. I am having so much fun. Thank God its Christmas, my cupboards are now bare of soap. I have sold heaps and will give the rest as small gifts.